The Savong Foundation is a 501(c)3 registered charity based in Los Angeles, California. Its mission is to support projects in northern Cambodia which includes the Savong School, the Savong Orphan Center, the Student Center as well as outreach projects in the community. I'm very proud to write that we just had our first year anniversary and what a year it has been! We have worked with people all over the world and have been involved in projects that range from finding sponsors for the children at the orphan center to installing a solar panel at the school. Earlier this year, we opened the student center which is home to ten "big kids" who attend the local high school and university. And on the horizon is extending the dental hygiene program implemented by the Angkor Hospital for Children so that more people are aware of the health benefits of a great smile. But like all charities, we can't do our work without you. We count on your support to help spread the word about the foundation and raise money for our projects. We are a small charity but we work hard in making sure that the donated funds go towards the people who are much less fortunate than ourselves. 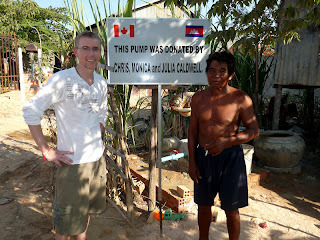 None of our board members take a salary and we cover all our travelling expenses to Cambodia with our own money. Sponsor a child at the orphan center or a student at the student center. Email me at phil@savongfoundation.org for more details. And of course, if you go to Cambodia, you can see everything for yourself! On behalf of the Savong Foundation, I sincerely thank you for all your support.